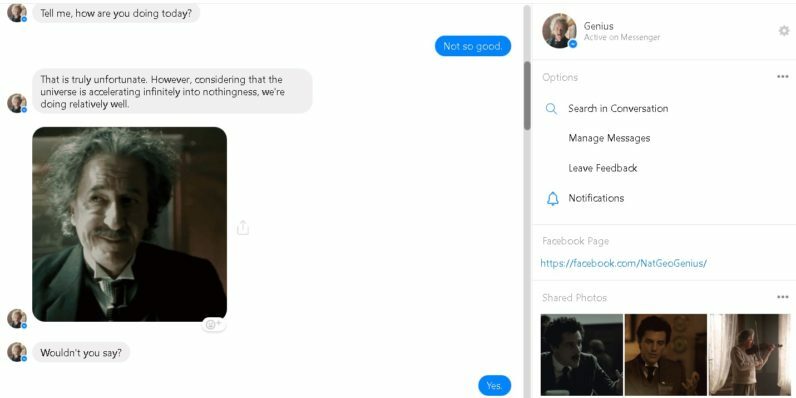 An Albert Einstein chatbot on Facebook Messenger is a window into how the chat service could be used as an educational tool — at least when it comes to simple facts. The chatbot is intended to promote National Geographic’s new show Genius, which is about Einstein. And it does that, with a constant stream of gifs and pictures from the show. The conversation was also bookended by references by both the show and a March for Science happening on the National Mall in D.C. this weekend. Don’t get me wrong, it’s not like I’d delved into a biography. I learned very basic information, such as when Einstein was born and died, the names of his wives, etc. Still, if I could talk to Messenger bots dedicated to teaching people simple facts about historical figures and their ideas/inventions/significance in a more organic way, the facts would definitely be more likely to stick in my head. With the Messenger API spawning ever more bots, here’s to hoping more educational ones crop up free of sponsorship.